It hasn’t been a good week for Flyers reporters. A week ago, Chris Pronger took a stick to the face that had everyone watching thinking the same thing: “did I just see Pronger’s career end?” An hour passed by and there was no word on his status. The more time that went by, the worse that fear got. No one at home knew if he was still in the locker room or if he was taken to the hospital. Finally, news that he was still in the building and had massive swelling around his eye, preventing a clean diagnosis came. But not by anyone who gets paid to cover the Flyers specifically. Instead the news was broken by Bob McKenzie of TSN and then Mike Brophy of SportsNet, both league wide reporters in Canada. After the game, Brophy again broke the news that Pronger was resting at home and should be okay. The Flyers reporters got beaten in their own house reporting on the team they cover by the visitors. That should never happen. It is their job to get that information first, every reporter in the building that day and their superiors should be embarrassed for getting swept on this coverage. Additionally, it should tell you something about how the Flyers feel about their local media that they gave this information to guys from Canada first. Today, the bad week only got worse. Ilya Bryzgalov should do interviews with his helmet on like Ricky Williams used to do. 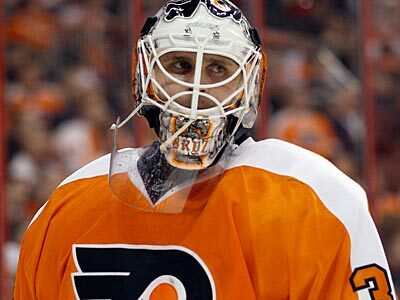 Ilya Bryzgalov has struggled lately and has decided that he doesn’t want to talk to the media on non-game days. The Flyers say that they ordered it, but I don’t believe that for a second and neither should you. Bryzgalov doesn’t want to talk to the media and the Flyers are saying it’s their decision to protect their player, which they absolutely should do (the protection part). Predictably, and somewhat understandably, the media has reacted to this with outrage. And then while I was writing this, they reversed course. Herman Cain is envious of their ability to say one thing then say the complete opposite only hours later. Hello Eagles win, it’s been a while. There was a lot of work for the Eagles to do going into Sunday’s pivotal game against the Redskins. And they crossed a lot of things off the check list. The Eagles had to run Shady McCoy more. They did. They had to stop the run. They did. They had to not blow a 4th quarter lead. They did. They had to win the turnover battle. They did. They had to get Brent Celek more involved in the passing game. They did. The safeties needed to play better. They did. So why does this win feel so vacant? They’ll have to do it again the following game, or it’s all for nothing. And then again the following game. And again, and again and again until they have dug themselves out of a 1-4 hole. So the best case scenario of this week’s must win game of the year is that it sets up the next game to be a the must win game of the year. “The NHL had a chance to send a clear and strong message that those kinds of actions are unacceptable and embarrassing to the sport. It failed. –Mario Lemieux, February 13, 2011. Yes, I know that Asham apologized for it after the game. Doesn’t change the fact that he did it. 2:15 to go in the 2nd quarter, third down and 5. Yeah, we’re looking at this play again, because it’s revealing and revolting. The Bills have all three timeouts, and even if they didn’t, they have the 2 minute warning. The middle of the field is still an option for them because the clock is not their enemy. The Eagles have called timeout, allowing Juan Castillo to instruct and coach his defense face to face. You know it’s going to be okay because Juan has worked very hard, implying that other coaches do not. "So... you guys got any ideas? Because I don't." We’re at the point where whatever the worst possible defense is for any given situation, you can pretty much bank on Castillo calling it. In 2010, Ryan Fitzpatrick was the 4th leading rusher among QBs. His 6.73 yards per carry was only 0.03 ypc behind league leader Michael Vick. Fitzpatrick was only 10th in the league in rushing attempts, so he didn’t scramble or run much, but when he did he was highly effective. So it’s third down, the clock isn’t a worry for the Bills and they have an effective runner at QB. You have to be alert for a slant, for a dig, for an in route and for Fitzpatrick scrambling. What do the Eagles do? Danny Watkins will get the start over Kyle DeVan on Sunday against the Bills. It’s unlikely that Watkins, the 26 year old rookie who has only been playing football for 4 years magically got better since the season started. He only dressed for one game. Improved his play and gained some confidence in practice, sure. Clear cut starter, doubtful. But this is a guy that was benched in favor of a guy off waivers. Although when it’s put that way, it shouldn’t be too difficult to beat that guy out. Kyle DeVan has not been good, but neither has Evan Mathis or Jason Kelce. Todd Herremans has been good, and Jason Peters as returned to his usual “good for 75% of the game” level of play. 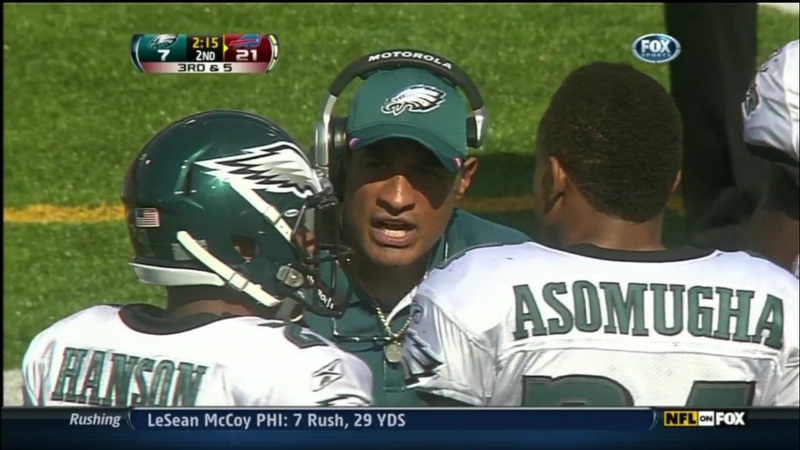 The Eagles constantly roll Vick out, almost exclusively when he is under center. Against the 49ers, DeVan gave up the only two sacks the 49ers had. The first one though, I can not blame him on, this one is on the coaching staff. This is a (short) story about the downfall of a very successful NFL head coach. Coach was a gifted offensive mind who led his team to such heights that he is undoubtedly the best coach in the franchise’s history. A franchise that had previously been to a championship games, so there was some competition. He was as good a QB guru as there was in the league, an incredible trait to have. When his original QB, the best the team ever had, left he went to an out-of-favor veteran and had success. He was able to take mediocre QBs and make other teams think they were legit starters. And at the end of his tenure he had a second franchise QB but his defense was never right. He changed defensive coordinators and it only got worse; it cost them too many games and eventually the playoffs. In his final season his ownership asked him to change in his defensive coordinator. He refused and was fired.